We couldn’t be more happy for proud of these two - both Hopscotch Alum (Caroline was with us from the start!). Over the last couple years we have watched their styles and talent grow as individuals. Their newest collab has us gushing over the whimsical and vintage details and we can NOT wait to see what is next from these two! You guys are both young forces - what brought you together to start Slowly But Surely? Madelyn: Funny enough, we actually met through us both working at Hopscotch. Well, I guess it was initially through following each other on instagram (as all modern day friendships start), but we first met in person at The Hop. Even though we only worked one shift together, we got along really well and that blossomed into us launching Slowly But Surely. Before SBS we both had previous artistic endeavors, but I think that having one another to keep us accountable and on track is really a plus. What's the story behind the name Slowly But Surely? Caroline: At first we did a lot of spit balling and brainstorming to try to come up with a name. After a few months of back and forth, "Slowly But Surely" got brought up and it fit super well, mainly because we are both procrastinators... We happened to get really lucky that our styles also meshed so well. Tell me about your product line and how you choose what will make it to market. 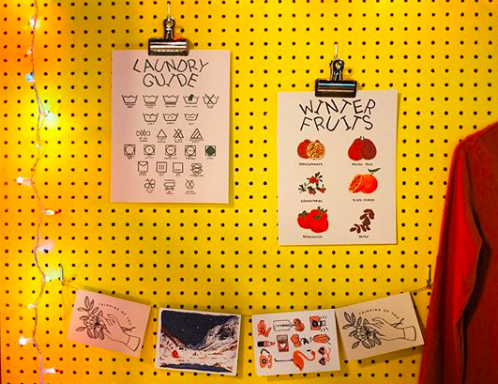 Caroline: Stylistically, I make a lot of nostalgic pieces, like the Kitchen Cabinet Print is full of things that I can still find in my mom's cupboard. While right now, we predominantly have art prints and earrings, we have plans for more. We have goals to expand our product line to be not just pretty things, but useful things too, like bags, tea towels, and ceramics. Madelyn: I think that since we both bring different skills to the table, it creates a lot of potential within our product line. For me, SBS is a way to make things that aren't necessarily commission based and it allows me to have more of a "for fun" mindset and to really explore all kinds of things that I am interested in. We have a lot of big ideas and they are all things that we love so our products are all made to the highest quality. Caroline: The sticky toffee pudding is my favorite desert of all time! Madelyn: I love it all, but anything with matcha is my weakness! Older Post2018, you were great!